Keeping 'The Legend Alive' on the World Wide Web since 1995! However now that all those forty something guys are having their mid life crisis and thinking of re-living their youth a bit, Capris are more popular than ever before and prices, largely thanks to Ebay, are rising dramatically. And worse still spare parts are getting increasingly hard to find and expensive to buy. 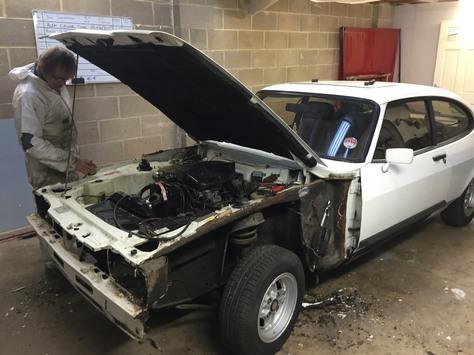 As it is my fiftieth birthday in 2016 I have decided to treat myself and try and get the Capri properly restored. So after nearly two years of searching and waiting I have finally commissioned Quest Brothers Classic Cars based in St Ives CAMBS to do the work. They are a small family business set up by Ian and Paul Quest who have been long time classic car fans. And they are based just around the corner from where I work so I can pop in most days and take some photos!